Police released body cam footage on Friday of a shooting from earlier in the week in which a 14-year-old was shot and killed while running away from a Tempe Police Department officer. The video shows the teen -- who ended up being armed with a replica airsoft gun instead of an actual gun -- with his back to the officer and at the far end of an alley when he's shot. Add Police Shootings as an interest to stay up to date on the latest Police Shootings news, video, and analysis from ABC News. The boy, Antonio Arce, was allegedly breaking into a car in the central Arizona city when a police officer responded to the scene Tuesday afternoon. The video shows the officer, identified by police as Joseph Jaen, walk into a dirt alley where the teen was inside a gray Chevy pickup. He pulls out his gun and hides behind a trash can before calling "hey" to Arce. 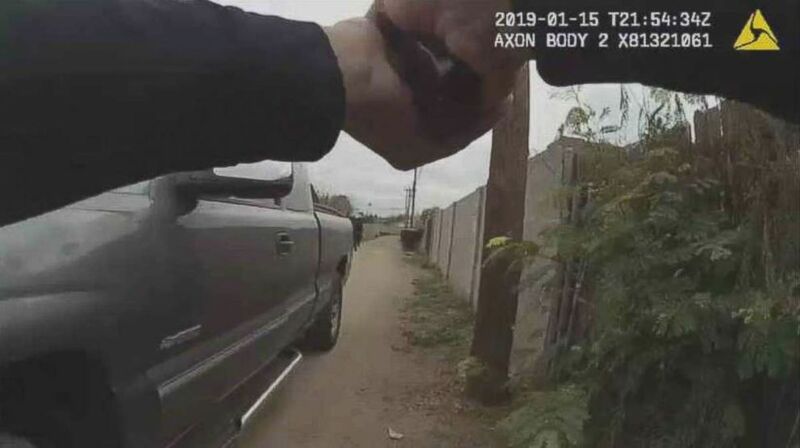 Tempe police released body cam footage of an officer fatally shooting 14-year-old Antonio Arce as he was allegedly burglarizing a car on Tuesday, Jan. 15, 2019. The teen flees in the opposite direction of Jaen as he steps out from behind the trash bin. Jaen runs past the truck, sees Arce and shouts, "Let me see your hands!" The officer opens fire with two shots just seconds later. "One of those rounds struck the suspect in the scapula area," Tempe Police Chief Sylvia Moir said at a press conference where the footage was released. The video clearly shows the teen running away from the officer at a distance, an apparent contradiction to what Tempe Police Sgt. Ronald Elcock said Tuesday: "The suspect turned toward the officer, at which time the officer perceived a threat and fired his service weapon." Arce continued running after he struck, at which point Jaen radios dispatch and says, "He's got a handgun." 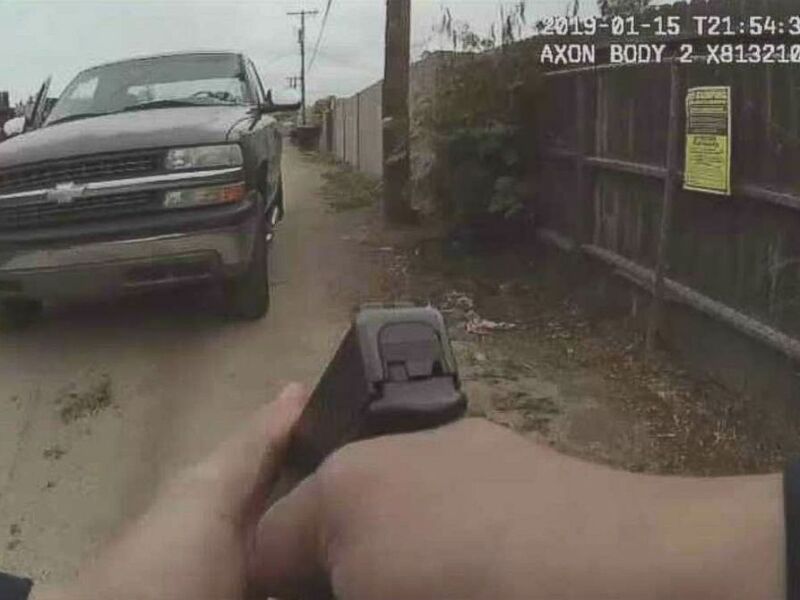 Jaen reaches the end of the alley at which point the body cam released by the police department ends before showing Arce's body. Moir said the officer found the suspect "lying between the sidewalk and the street" and radio traffic from Jaen to dispatch reveals, "I'm not shot, the suspect is, and it looks like he's not breathing anymore." Officers began CPR and he was taken to a local hospital where he was pronounced dead. "If they want to tarnish my son, they are wrong," Sandra Gonzalez, Arce's mother, told Phoenix ABC affiliate KNXV through a translator on Wednesday. "Apart from the fact that they killed him, they want to destroy him. No, I won't allow it -- I want justice." 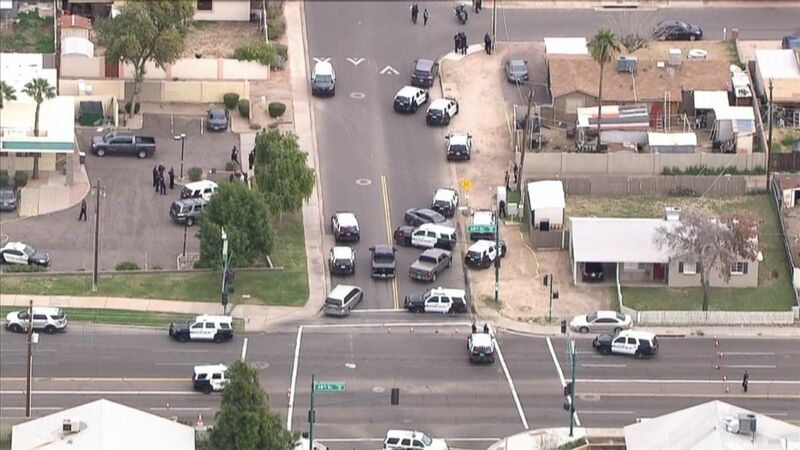 Police surround the area where an officer fatally shot 14-year-old Antonio Arce as he was allegedly burglarizing a car in Tempe, Ariz., on Tuesday, Jan. 15, 2019. The family had not seen the body camera footage at the time. Jaen has been placed on administrative leave pending an investigation into the shooting. "I just know he's doing better and he's in a better place now," his brother, 14-year-old Jason Gonzalez, told KNXV. "I mean the police officer has a Taser gun right? I mean, why not shoot a Taser at him? He sees a young boy. My brother wouldn't shoot, I know he wouldn't shoot."